John Briggs accepts the Swanstrom-Baerwald award from Archbishop Bernardito Auza at a a ceremony at Keating Hall. More than 76,000 migrants crossed the United States southern border without authorization in February, an 11-year high. Three countries—El Salvador, Honduras, and Guatemala accounted for a high percentage of the migrants, and many of them immediately applied for asylum. On March 13, John Briggs, GSAS ’09 was honored by Fordham for working to solve the problems behind this crisis. 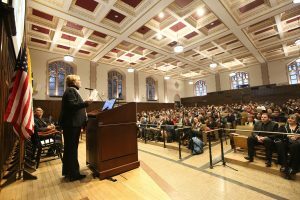 In a ceremony held in Keating Hall’s spacious first-floor auditorium, Briggs was awarded the sixth annual Swanstrom-Baerwald Award, which commemorates the partnership between Catholic Relief Services (CRS) and Fordham’s International Political Economy and Development program (IPED). Archbishop Bernardito Auza, Apostolic Nuncio and Permanent Observer of the Holy See to the United Nations, presented Briggs with the award. 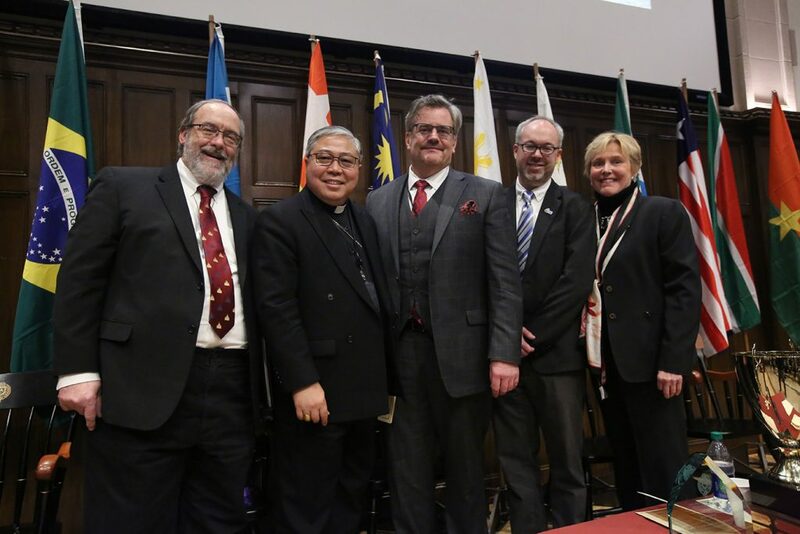 “More than personally receiving the award, what was really special and motivating for me was the opportunity to meet with such an interesting group of students, professors, and bishops such a diverse group, and to have them all focus on CRS,” Briggs said. A native of North Carolina whose parents moved his family to Guatemala to do humanitarian work when he was a teenager, Briggs returned to the United States for college. After earning an undergraduate degree in business, he briefly worked in investment banking. But after a stint in Nicaragua with the Peace Corps, he fully embraced humanitarian work, enrolling in the IPED program in 2008. His first assignment with CRS, in 2010, was in Afghanistan; in 2012 he moved to Guatemala, where he is currently head of programs for CRS. Briggs was the sixth recipient of the Swanstrom-Baerwald Award. In remarks he delivered at the ceremony, he focused on three aspects of CRS’ work. One is the ongoing relief efforts to mitigate the damage caused by the eruption of the Volcano Fuego in June 2018, which resulted in 200 deaths. Another is implementing programs that improve people’s lives that can be expanded on a larger scale. One of them, called “Learning for Life” is a 5-year-long, $27 million project funded in part by the U.S. Department of Agriculture. It provides 60,000 daily meals to primary school students who would otherwise be malnourished and susceptible to stunted social and cognitive development. To address the issue of migration, Briggs said CRS has embraced YouthBuild, a program that has been a model for youth employment since it debuted in Harlem in the 1970s. Since young adults with little hope for opportunity are among those most likely to flee the country, CRS has worked with people such as Claudia, a 24-year-old single mother of two whose grief over her mother’s death was causing her to be depressed and neglectful of her children. “Claudia received individual therapy from a psychologist and began to gain self-esteem and heal emotionally. She gained new life skills and new work skills. As she developed these skills and participated in community service projects, she gained confidence in her ability to set goals and achieve them,” he said. Over the last three years, 81 percent of YouthBuild graduates have found employment, started a business, or gone back to school. He noted that CRS has established 14 really strong connections with local employers. Briggs said he’s hopeful that many of these businesses will be able to launch YouthBuild programs of their own, thus giving would-be migrants a reason to stay and build stronger communities at home. “These are real opportunities to grow and to expand, and the connection couldn’t be clearer. Youth are at the heart of all these causes of migration. They’re the ones that suffer the most, and you have a program that directly responds to that by giving youth opportunities,” he said. CRS Northeast Mid-Atlantic Regional Director Maureen McCullough thanked those in attendance for attending and supporting the organization. Briggs said there have been significant challenges when it comes to climate change as well. In four of the six years that he’s lived in there, Guatemala has grappled with severe droughts, and the other two years weren’t substantially better. “Every year, as we put together these project designs, we say, ‘We’re going to respond to the droughts, and we’re going to help people be stronger going forward the next year,’ and then another drought hits, and it’s even harsher,” he said. He credits his time in the IPED program with giving him the tools to grapple with complex, multidimensional work that touches on issues of politics, economics, and the environment. “Fordham did a good job of helping prepare me to tackle those multidimensions and try to make some sense out of it, as hard as that is,” he said. 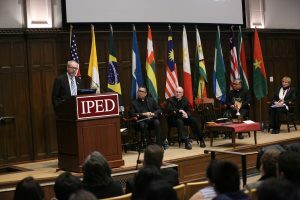 The ceremony was followed by a dinner, where the IPED program conferred the John F. Hurley, S.J. Commendation on Tom Dobbins Jr, LAW ’90, for his work as Justice and Peace Coordinator for Catholic Charities of the Archdiocese of New York.